“We LOVE Logo (Adventures)… it has been a wonderful part of our homeschooling. I have been spreading the word among my homeschool friends, too, because it is an area where there is a need for ‘curriculum’ and most of us are not equipped to teach these skills.” — Christine Michaud, a military wife. Many homeschool families have used this curriculum. See what others are saying about it! A well-educated child is one who loves to explore, investigate, and create. It’s that sort of mind-set that inventors of the Logo computer language at MIT sought to foster. Using our Logo-based homeschool curriculum, kids have a blast creating geometric drawings, creating simple animations, and combining those skills to create a “board game” and an animated greeting card. While having fun bossing the turtle on the screen around, the kids are learning logic painlessly. Sound like good brain exercise? You bet! The kids command a tiny robot turtle carrying a pen and a bucket. They tell it where to go on the page, giving commands like “forward 50” (go forward 50 turtle steps). The turtle draws lines as commanded and dumps colors. For animations, the turtle assumes a variety of shapes. Not only is Logo great for teaching reasoning to young kids, but it has all the bells and whistles of a robust programming language, including parallel processing. So it’s a natural for teaching game programming. Skills learned on it transfer easily to other languages. In fact there are many computer professionals out there who got started by learning Logo. To find one, just ask around! My curriculum uses Logo as formulated in MicroWorlds software. Logo Adventures is planned for learning once a week for one hour. There is also a troubleshooting appendix and an answer key. See the Table of Contents.See a sample chapter. 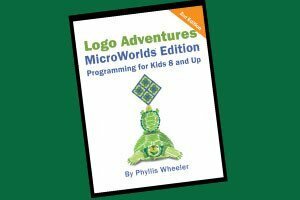 Besides the book, the second component of the Logo Adventures curriculum is the software disk for MicroWorlds. Purchasers of this book will receive instruction on how to purchase a disk or download at more than 50 percent off. I have tutorials to get you started on the Support page. Check the appendix on troubleshooting and the HTML guide in the back of the book. Look at my FAQ on the Support page. If all that fails, email me with your question at info “at” motherboardbooks.com. I answer emails as soon as I can, normally within a day. What are others saying about this curriculum? “It’s safe to say my kids are currently somewhat obsessed with Phyllis Wheeler’s Logo Adventures, available from Motherboard Books. I had never heard of the Logo computer language, invented years ago at MIT to teach children problem solving…. “…Seeing such determination and passion in my son, I was determined to get him started in the right direction so that he can start his programming career. You know how we homeschooling moms are! I did a lot of research and found the best fit for our needs: Motherboard Books. “There are a few options to choose from, but since my son was 9 (about to be 10 at the time), I wanted to start him on something that he could do on his own (well, mostly on his own). We started with the program: Logo Adventures. It’s designed for children between the ages of 8 and 12 and it uses an MIT software program called MicroWorlds. “Phyllis Wheeler, the mama behind Motherboard Books, has done a tremendous job of breaking down the concepts of programming into steps that are easy to follow and understand. I program in Lotus Notes for my work and it’s difficult sometimes for me to understand what I’m doing. However, with MicroWorlds and Phyllis’ instructions, it’s a joy!! “My son really enjoys programming. He’s been learning how to draw shapes, move the ‘turtle’ forward and backward, turn him around using angles and position him differently on the page. “If your child is interested in learning how to program then Logo Adventures is a great place to start. I would highly recommend it for your child. It’s definitely been a winning experience for my son (who plans to start his own gaming company that he’ll pass down to his children and grandchildren). Those are his dreams and ambitions! Who am I to stand in his way? Check out Motherboard Books. You won’t be disappointed! “Geared towards younger children, Logo Adventures is the perfect way to get your eight- to twelve-year-old into the world of programming. Easy-to-read text, fun programs, and lots of review make this a great curriculum.” –Elliott Robinson, age 17, reviewer for www.HomeschoolChristian.com. “…Now that we own Microworlds and your easy-to-read and follow lessons, I think I have found the answer to my prayers. It is really a blessing as my son is so quick with electronics, as most children are, but has always struggled in school. We do not own or encourage video games so it is great to hear him saying, “Well now I can write my own, Mom!” –Jeanette H.
To use this book, you will need to make an additional purchase of software from the software maker. Your software download purchase price of $29.70 is a 70 percent savings from the $99 retail price, for buyers of Motherboard Books curriculum. When you receive your book, you will find instructions for retrieving a coupon code. The code will give you the discounted price on a software download for Mac or Windows from the software maker. If you require a CD, you’ll pay $45 including shipping to anywhere in the Continental US. Choose the MicroWorlds software edition at Amazon.com to make your purchase. Or choose the Terrapin Logo edition. 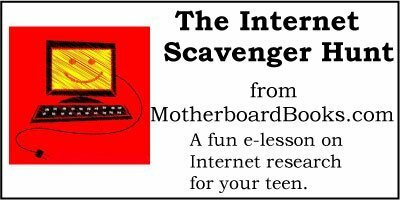 Get Your Free Internet Scavenger Hunt!